The senior friendly apartment is on the ground floor and has a separate entrance. All rooms of the cozy 3-room-apartment are decorated with love, pine furniture and the change from carpeting with tile and wood flooring contribute to the well-being. You are welcome to dine in the kitchen with stove, to retire with a good book from the bookshelf in the living room or on one of the rare rainy day, stay for the game or TV there. The apartment is fully equipped, linen and towels are provided, you will find in the kitchen microwave, stove and dishwasher. In the living room TV, radio, telephone with private number and DVD player are available. The kitchen is furnished as a living room with seating area. The larger of the two bedrooms offers a double bed (180x200, separate mattresses) and a tea corner (2 cups, kettle, tea, coffee), the other two comfortable single beds (90x200). The bathroom has a modern shower, there is also the apartment's own washing machine. Firewood is provided free of charge. The comfortable apartment is located in an apartment house idyllic and very quiet. Recreation can be found in the large garden, which offers many dwellings, terraces, hammock, barbecue areas, fire bowl and a playground with table tennis and swing. The senior friendly apartment is located on the ground floor and has a separate entrance. All rooms of the cozy 3-room-apartment are decorated with love, pine furniture and the change from carpeting with tile and wood flooring contribute to the well-being. You are welcome to dine in the kitchen with stove, to retire with a good book from the bookshelf in the living room or on one of the rare rainy day, stay for the game or TV there. The apartment is fully equipped, linen and towels are provided, you will find in the kitchen microwave, stove and dishwasher. In the living room are television, radio telephone with private number and a DVD player available. The kitchen is furnished as a living room with seating area. The larger of the two bedrooms has a double bed and a tea corner, the other two comfortable single beds. The bathroom has a modern shower, there is also the apartment Private washing machine housed. Dogs and other pets are welcome. Firewood is provided free of charge. Es war alles wie beschrieben, und wir haben uns sehr wohl gefühlt. 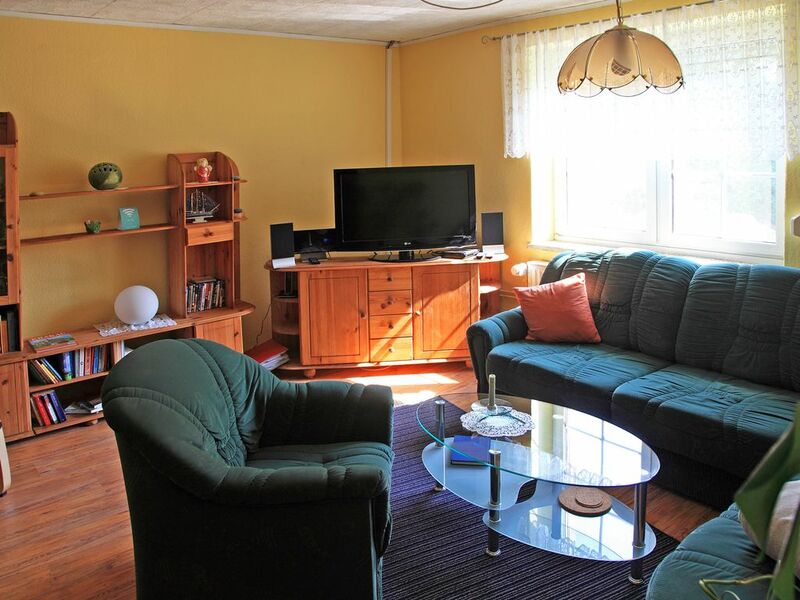 Our apartment is very suitable for a family holiday, the Baltic Sea is only 20 minutes away, the historic towns in the area lend themselves to cultural and culinary excursions. Bömitz is located between the Hanseatic cities of Greifswald, Wolgast and Anklam. The Baltic (z. B. the beach Freest with beautiful sandy beach and child friendly since long shallow water available) and the island of Usedom is only about half an hour drive away. In the region one can very well hiking, canoeing (on the Peene), riding and much more. In the village there is a restaurant with very good kitchen.